I recently attended an altered book workshop run by the lovely Sam Tickner and Rebecca Peacock of Firecatcher Creative. 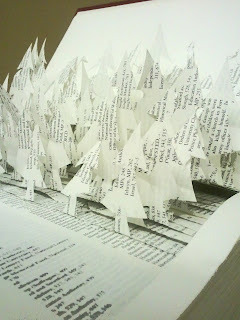 I spent most of the day just playing with different ways of altering the book, finally creating a forest which popped out of the pages. It was a really inspiring day taken from both Sam and Rebecca's creations and others on the course. You can see more images from the workshop here, firecatcher altered book workshop. I already have plans for my next book so watch this space!